August 2015 - Performing as part of a harp quartet in Bangkok. The event was organised by the Tamnak Prathom Harp Centre. 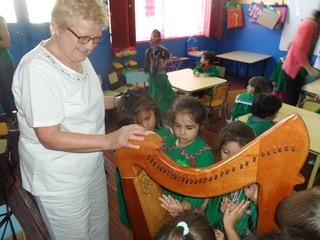 2 March 2015 - To mark the 150th anniversary of ‘Y Wladfa’ the Welsh settlement in Patagonia, Elinor Bennett delivers one of two harps to the children Ysgol Meithrin Trelew. April 2015 - Singing during a concert in Gaiman, Patagonia.